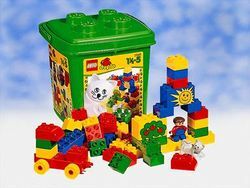 2268 Medium Bucket is a DUPLO set that was released in 1998. It contained 50 pieces including a DUPLO figure. This set is the same as 2493 Medium Bucket. Facts about "2268 Medium Bucket"
This page was last edited on 15 March 2016, at 05:33.